Definition at line 495 of file llinventorybridge.h. Definition at line 507 of file llinventorybridge.h. 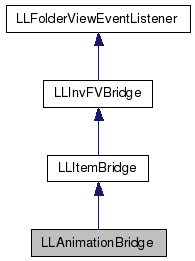 Definition at line 3024 of file llinventorybridge.cpp. References LLInvFVBridge::getClipboardEntries(), hideContextEntries(), LLInvFVBridge::isInTrash(), LLInvFVBridge::isItemRemovable(), lldebugs, and llendl. Definition at line 3019 of file llinventorybridge.cpp. References LLAssetType::AT_ANIMATION, FALSE, get_item_icon(), and LLInventoryType::IT_ANIMATION. Definition at line 499 of file llinventorybridge.h. Referenced by openItem(), and performAction(). Definition at line 3094 of file llinventorybridge.cpp. References LLFloaterView::adjustToFitScreen(), FALSE, LLItemBridge::getItem(), LLInventoryObject::getName(), LLFloaterView::getNewFloaterPosition(), getPrefix(), LLControlGroup::getRect(), gFloaterView, gSavedSettings, left, LLRectBase< Type >::mLeft, LLRectBase< Type >::mTop, LLInvFVBridge::mUUID, S32, LLFloater::setFocus(), LLPreview::show(), top, LLRectBase< Type >::translate(), and TRUE. Definition at line 3057 of file llinventorybridge.cpp. 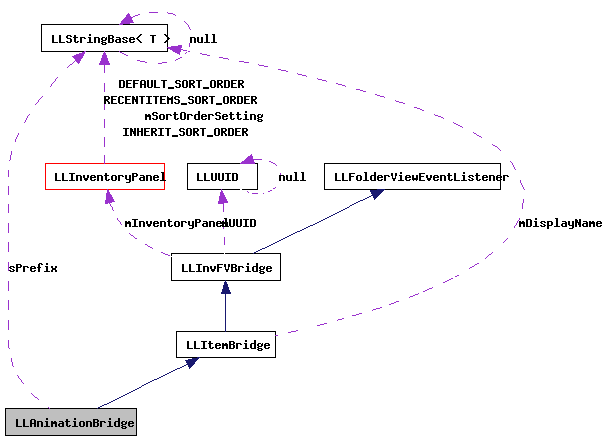 References LLFloaterView::adjustToFitScreen(), FALSE, LLItemBridge::getItem(), LLInventoryObject::getName(), LLFloaterView::getNewFloaterPosition(), getPrefix(), LLControlGroup::getRect(), gFloaterView, gSavedSettings, left, LLRectBase< Type >::mLeft, LLRectBase< Type >::mTop, LLInvFVBridge::mUUID, LLItemBridge::performAction(), S32, LLPreview::show(), top, and LLRectBase< Type >::translate(). Definition at line 497 of file llinventorybridge.h. Definition at line 511 of file llinventorybridge.h.